Dragon Age Inquisition has no miraculous item instantly. It is, in general, a game that requires its players to strive to achieve much more powerful items. Each defeated enemy or open chest is impossible to know what will be received by the inquisitor. The randomness of everything in this title is also one of its strengths, as it makes the gamers have to devote much more to achieve good things. Although you can buy good items in different game markets, the best weapons and armor are direct results of the construction and improvement of Dragon Age system. If you have the correct schematic and the best materials, you can build a sword more sharp, or an ax that causes more damage. The process works simply, each weapon or armor requires the use of resources of different categories, such as metal, fabric, leather, etc ... Use a cotton cloth to fabricate a tunic will give you a +4 bonus against fire, same object when built with a bearskin will +2 resistance against magic. To get the best items you should try a lot with the different materials that the game offers. This also allows you to different members of your group using the same equipment with absolutely unique properties in each. 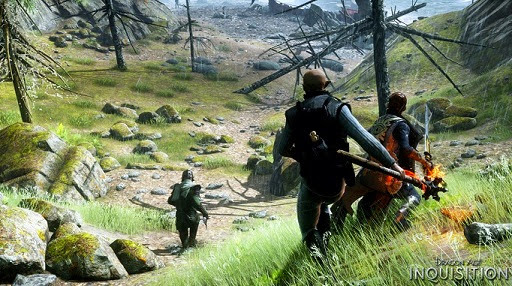 Unlike previous games in Dragon Age Inquisition the wise men of his party does not have the ability to heal other members during fights. This not only made the game more difficult, but also increased in importance the healing potions. The change is that now these items are no longer found or purchased there, but part of a finite stock which is always recovered you back to your headquarters. Nevertheless, besides the common potions, the game lets you create your own versions of this miraculous item with different properties such as regeneration, Lyrium, and so on. To achieve these special versions is necessary to find the right materials to explore the world. You can also enhance the effects of different potions of the game, which will force the inquisitor to spend even more time on collecting herbs and plants in the field, or rolling chests to find all the ingredients that the recipe requires. All this leads us to the following conclusion: there is a particularly amazing and special item in Dragon Age Inquisition, which there is the constant need to spend much of its time in the missions collecting the correct materials to achieve enhance almost everything you find during the game, their weapons until the healing potions. When you reach the first exploitable area of the game, the Hinterlands, it is recommended to spend at least half an hour dedicated solely to visit all possible sites and collect the different features that the site has to offer. Do this on all subsequent regions and before long you will have access to the best items that Dragon Age has to offer.